As the temperatures cool and the nights start drawing in, my thoughts turn to cosy clothing and a spot of knitting. I really like my first pair of knitted socks and was keen to make some more, but also to try different styles. So when I saw the Craftsy knit original cuff down socks class on sale, I enrolled right away. 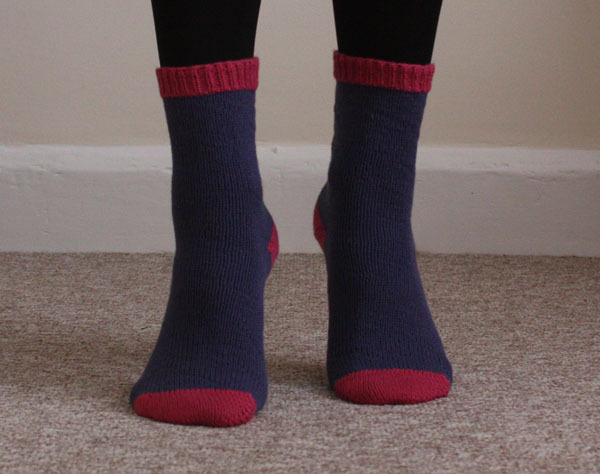 If you want to knit socks with easy customisation options I would highly recommend this class (there is also an equivalent toe up class if that is your preference). The tutor Donna Druchunas takes you through the fundamentals of sock construction, including a variety of stitch patterns suitable for socks along with both video walk throughs and written patterns for 3 heals and 3 toes so you can mix and match to your heart’s content. While I love the self striping pattern of my first pair, my skin is quite sensitive to wool so I can only comfortably wear them over tights or other socks. Hence for my next pair, I wanted a yarn that was cotton based with no wool content – turns out this is not easy to find in a sock yarn! Eventually I found a yarn called superba cotton stretch which is 79% cotton, 18% polyamide, 3% polyester at Liss Wools, a lovely village shop in Hampshire near my parents. I’m afraid I can’t find a link to the same yarn, but I brought colours 003 and 004. Despite the many stitch options covered in the class, I felt that a classic pair of socks in stocking stitch would work well with the solid colour yarn I had. Although I used a contrast colour for the cuff, heal and toe to add interest. I ended up unraveling and restarting twice in order to get them the right size as they started out way too baggy. I see now why the rib pattern of my first version was such a good choice, far more forgiving fit wise! For the cuff I did a simple 1×1 rib then the heal and toe are short rows which I hadn’t done before. It wasn’t until I’d done the heal of a sock that I could try them on to make accurate assessment of the fit, so the unraveling meant I got plenty of practice at short rows! Once I got the hang of it, I didn’t find it very difficult and like the look it gives with the solid colour socks. The heals get quite stretched out when wearing which shows a few small holes where the heals start, which probably means my technique could do with some improvement! 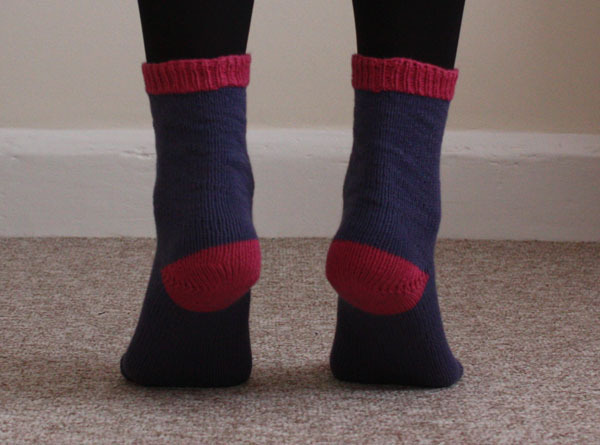 I really enjoyed working on the socks – a great project to work on while watching TV or chilling out with friends/family as the majority is just simple knitting in the round. So it wasn’t long before I had the next pair cast on using the opposite colour combination. I decided to go for a stripe pattern this time as I wasn’t sure I wanted so much pink. I don’t think I was carrying the blue yarn in the best way as there is a bit of a ridge down the stitches on which I was switching, but I don’t think it really matters for a project. I might even call it a design feature! The yarn is lovely and I like the colours together, but I think there were only one or two other solid colours to choose from at the shop. Must admit I feel a little disappointed at the fact that of the many lovely self striping sock yarns out there I couldn’t find any that had no wool, so if you know of any non wool sock yarns, especially of the self patterning variety, please let me know! I’m very tempted to make myself another pair as I enjoy knitting them, but if I’m honest with myself 3 pairs of knitted socks is really all I need. Perhaps I should switch to a pair of mittens for a similarly straight forward knitting project! Are you a sock knitter? Do you have a favourite heal and toe style or preference between knitting them cuff down or toe up? These are impressive! I really like the stripy ones – you should make some matching gloves / mittens! Ooo, matching gloves or mittens would be pretty cool, maybe a matching hat too!